For more than a century, talented and high-performing people have formed the foundation on which Dana's success has been built. From the assembly line to the Corporate office, our people reflect the company itself - they are innovative, creative, dedicated, and diverse. 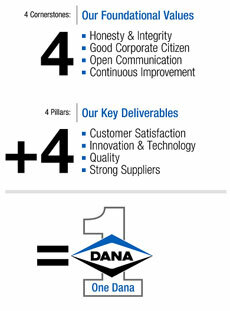 Dana people share a common vision of being the very best they can be in their respective disciplines. Collectively, they leverage these talents to support our customers by translating customer needs into value-added products, processes, and services. We encourage and enable our people to advance their own careers through personal growth, development, and continuous improvement. Through these efforts, Dana people will continue to provide the foundation for Dana's growth and success in our second century, and beyond.